P. A. Nisbet, Elysian Fields, Oil on Canvas 28" x 24"
A former U.S. Navy line officer who served at sea in the 1970s, P.A. Nisbet continues to be inspired by water. His newest paintings are based on scenes from his travels during the past year along the Pacific Coast, including locales as far away as Maui and Chile, with emphasis on the coastlines of Oregon and California. With most of his focus on the American coast, his new paintings represent a stylistic departure. 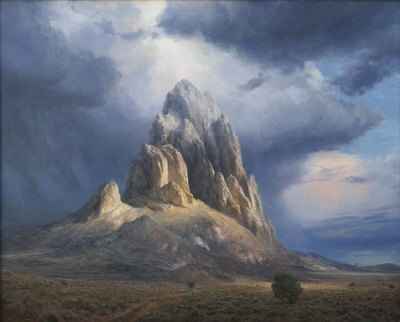 Rather than tight renderings with realistic and intricate details, most of the latest pieces include a more tonal and emotional interpretation with emphasis on subdued lighting situations. P. A. Nisbet, Dawn, Sea of Cortez, Oil on Canvas, 36" x 52"
P. A. Nisbet, Rain God, Oil on Canvas, 40" x 48"
Two of Nisbet’s new paintings – Breaker and Cape Kiwanda – portray strong surf scenes that pay homage to the power of water. These images capture the shapes of the waves and the way in which light manifests itself. 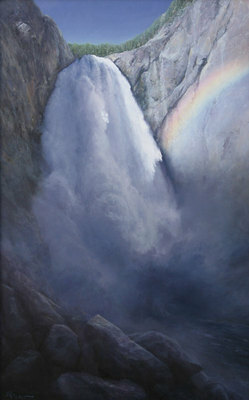 P. A. Nisbet, Lower Falls of the Yellowstone, Oil on Canvas, 48" x 30"
Nisbet, who is strongly influenced by romantic landscape painters of centuries past, credits J.M.W. Turner as his most powerful inspiration. 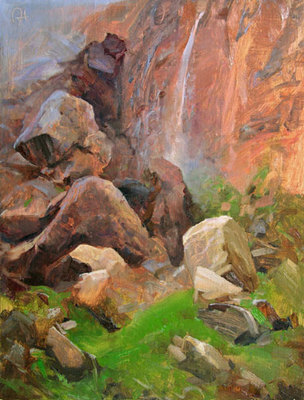 Based in Santa Fe, Nisbet works directly on site painting 9-by-12-inch plein air sketches. Back in the studio he reworks these ideas with multiple layers of paint and glaze, incorporating his original inspiration into the finished piece. 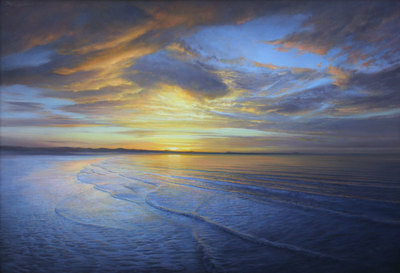 Expansive vistas and towering clouds, as well as the subtle qualities of depth and light, mark Nisbet’s paintings. 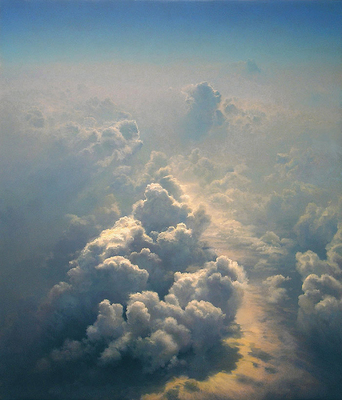 In an effort to capture the ethereal spirit and deep space of a specific landscape, he slightly curves the horizon so it appears to be viewed from above. Nisbet’s paintings appeal to lovers of nature and to those who have respect for the values of the ages, where mastery in the arts was of the highest attainment. P. A. Nisbet, Gardens of Gilgamesh, Oil on Panel, 12" x 9"